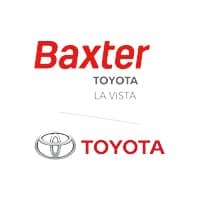 Welcome to Baxter Toyota La Vista! When you shop at our dealership, you can be assured of receiving a personalized customer service approach that always puts your needs and desires first. Our team has been trained to help you find the vehicle that fits your precise profile, and we’ll do everything we can to make the process as fast, easy, and pleasant as possible. This includes securing competitive financing to all of our customers. And once you’ve purchase your vehicle, you’ll be able to get top-of-the-line Toyota maintenance and repairs from a team of factory-trained and certified technicians at our dealership. Over the decades we’ve provided customers with top quality vehicles and service, we’ve received many prestigious awards. In fact, we’ve won the valued Toyota President’s Award 20 times, as well as the Leaders of Excellence Award, Parts Excellence Award, and President’s Award. We take these awards as a sign of our proven track record of excellence, and we’re committed to keeping that record going for many years to come. When you’re ready to for a vehicle and a service experience that exceeds the competition, come to Baxter Toyota La Vista at 7204 S 124th Cir in La Vista, NE. Contact our sales team today to set up a test drive!